So, I know many of us, at least north of the Mason-Dixon line, are starting to experience the last of the summer love. When I woke up this morning, it was 52 degrees. 52! That’s getting dangerously close to the 40’s, which is downright cold. Brrr! This Louisiana girl will be heading south soon! This means that we all need to be taking advantage of every minute of warmth we can. Before we know it, I’m going to be on here writing about rainy fall afternoons, fall handbags, and eco-friendly sweaters and coats. Yikes! I wanted to highlight some awesome, fair trade, eco-friendly flip flops I found by complete accident today. This company I found, feelgoodz, is really amazing. 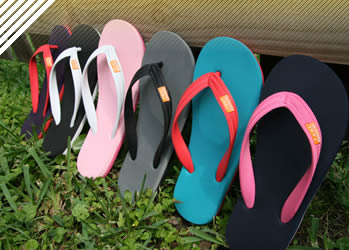 First, they use all-natural rubber in their flip flops, instead of EVA foam (which most other flip flops are made from). Using all-natural rubber means that these flip flops are 100% biodegradable. Yay! You can even compost them in your garden or worm bin. Buying products from natural rubber trees helps ensure that more rubber trees get planted. And, since rubber trees do an awesome job filtering our air, this is a win. Feelgoodz also looks after the health and welfare of the rubber farmers supplying their source materials. They ensure trade is fair, and safe. They’re also in the process of getting Fair Trade Certified. We’ve gone through this lengthy process with Earth Divas, so we know how time-consuming it can be. Good luck, feelgoodz! The story behind the creation of feelgoodz flip flops is also super inspiring. It involves a young college grad being in the right place at the right time, a hot dog cart, and a one-way ticket to Thailand. Yeah, I’m not making that up. You can read the story here. It’s good. Although summer is on the wane, if you’re looking for one more pair of flip flops to wear around until the leaves start falling, give feelgoodz a look. Their colors are bright and simple, and you can rest easy knowing that your purchase is helping support people in Thailand. And since many of our own artisans are based here as well, this is a company we feel great supporting!